My goal has always been to curate customized and personalized photography sessions for my clients. So even though I’m not a wedding photographer, when Nidhi asked me to do a pre-wedding photo shoot for her and Mehul, I saw it as an exciting opportunity and said yes. Last year, I had done a photo session with Nidhi’s sister, Nishita, and she was familiar with my work. She loved the photos of that session. She told me that she liked my style and was sure about wanting me to do her pre-wedding photos. 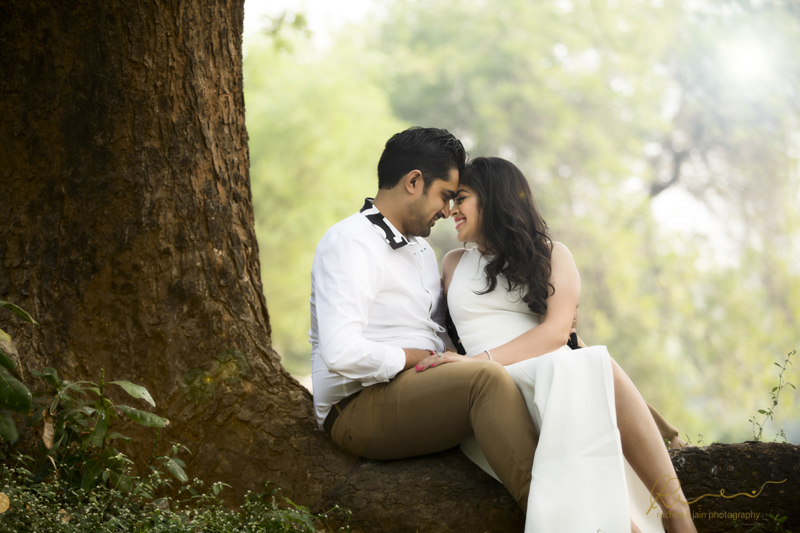 Nidhi and Mehul are one of the perfect couples that make you believe in destiny, that they were meant to be together. It’s ridiculous how crazy in love they are. Not only that but they also made for perfect clients. They were so easy to work with, so patient and fun. One of the options we suggested was to photograph them outdoors with a beautiful swing. The aim was to give the photographs a sense of ethereal fantasy. Nidhi was smitten by the idea and we got busy. On every shoot, the photographer is also a director, a cinematographer and a stylist. With Nidhi and Mehul too, I told them to wear certain colours, to stand amidst the bushes, to sit under trees, to stand on a bench, to climb a tree, etc. As clients they were very willing and open to my directions, they listened. Mehul stayed calm through the whole shoot, understanding the kind of shots I wanted and not making a fuss about this photographer bossing him around. It also said a lot about the kind of man he is- composed and considerate. He’s also a movie-buff and a Salman Khan fan so we got him striking a few filmy poses too! As for Nidhi, she is so naturally gorgeous in front of the camera, her smile always flawless. She has the grace and elegance that is inspiring. It was such a delight photographing her. Together they make for an adorable couple. It’s hard to imagine that their story started by a coincidence, meeting through a mutual friend. When you’re with them you can sense the intimacy they share. Mehul couldn’t keep his eyes off his bride-to-be and she couldn’t stop smiling every time her eyes caught his. He would lift her up when she couldn’t walk in her heels. He treated her like a princess, like she should be. They have an amazing chemistry! Their pre-wedding session lasted only two hours but we had such a great time shooting it. I’m so glad I could photograph them and capture their romance. I hope that they always remember and keep this love that they have for each other in their hearts for all the time to come. Thank you for letting me be a part of your beautiful journey.